Nano-engineers at the University of California, San Diego, have developed and demonstrated a novel and highly innovative technology that can fabricate three dimensional (3D) micro-structures out of soft, biocompatible hydrogels in a matter of seconds. The Chen Research Group -- spearheaded by nano-engineering professor Shaochen Chen -- is bringing nano and structural engineers, medical device labs and visual artists into a collaborative environment under one roof to pioneer a 21st century renaissance in next generation technology. The synthetic fabrication of complex natural structures like spirals, flowers and hemispheres, has now been demonstrated via this new technology. Printing 3D Blood Vessels in Seconds out of Biocompatible Hydrogels! 1. The goal of many biomedical researchers is to find a way to grow new tissues or even organs for those patients who need them. To do that, the cells involved need to have a structure they can grow on, like plants growing on a cage or trellis. 2. Near term, the 3D microstructures technology which is now being pioneered, could lead to better systems for growing and studying cells, including stem cells, in the laboratory. 3. Medium term, the goal is to be able to print smaller biological tissue patches for regenerative medicine. For example, in the future, doctors may be able to repair the damage caused by heart attacks by replacing damaged tissues with newly printed biocompatible synthetic tissue. 4. In the long term scientists hope to see this new technology, or indeed an evolution of this technology, used to actually print complete tissues and organs, ready for implanting into patients. 5. The key future goal in the development of this innovative technique is for humankind finally to acquire the capability of biological tissue and organ printing for use in full fledged regenerative medicine and advanced body repair. This could extend the average life span of human beings by decades. The key benefit of this brand new technology is the ability to print microstructures in a few seconds whereas up until now other three-dimensional fabrication techniques -- like two-photon photo-polymerisation -- used to take hours to fabricate a similar structure. This type of new technology has already been the subject of science fiction: many "replicants" have been fabricated instantaneously via "3D replicators" using advanced laser controlled technology. Are we almost there? 3. Fabricates faster than other methods to produce 3D micro-structures. The bio-fabrication technique called "DOPsL" uses a computer projection system and precisely controlled micro-mirrors to shine light on a selected area of a solution containing photo-sensitive biopolymers and cells. 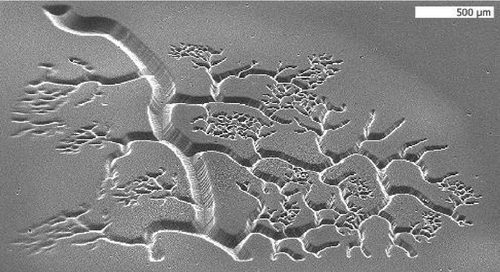 This photo-induced solidification process forms one layer of solid structure at a time, but in a continuous fashion, like a 3D printer. Micro-contact printing and photolithography are existing fabrication techniques which can only produce two-dimensional structures and simple geometries. Another technique that can print three-dimensional structures called stereo lithography is best suited for large objects such as car parts and tools. The new DOPsL technology leap-frogs all these existing solutions both in terms of refinement of 3D resolution at a micro-scale and speed-of-delivery of manufacture or fabrication via high speed printing! Nano-engineering specialist Chen Research Group has essentially demonstrated the capability of printing three-dimensional blood vessels and tissue in mere seconds out of soft, biocompatible hydrogels. Being able to print blood vessels within tissue is essential to achieving the promise of regenerative medicine because this is how the body distributes oxygen and nutrients. An engineered biomaterial without the blood vessels is not of much use to a living organism including human beings.